This topic contains 71 replies, has 7 voices, and was last updated by Stephen Madjanovich 2 months, 1 week ago. Finished watching the video and made some notes. I will have to look a few things up but here are some first impressions. At 29:20 you mention a correction will need to be made to the Mujahideen vs Soviet assets as they don’t agree with respect to types of mines and reactions. Have you reviewed this and if so what is the answer? Why can you fire “through” civilians when you can’t do so through friendlies? I would think this would be the same PLUS the restriction on attacking targets within 6″ of civilians IN ADDITION. Why have different quality levels of spotting teams? You make no mention that they have to make a quality check in order to “spot” units or am I missing something or was it missed in the rules? I can see making a quality check before attempting to call in an attack. Or is the quality only for survival effects? I find having to swap between different dice as well as cards at different points in the game turn awkward and confusing. To access “face cards” for air strikes and helicopter support is an 18 in 58 chance. Close enough to 2 in 6 chance to be easily replaced by a 5+ on a D6 roll. Since morale is checked at the end of a turn then a 2D6 roll is less awkward as ALL units are handled the same way and at one time. My initial impression that units are “moraled” to death still holds. However, when played over more turns the snowball effect is more pronounced. 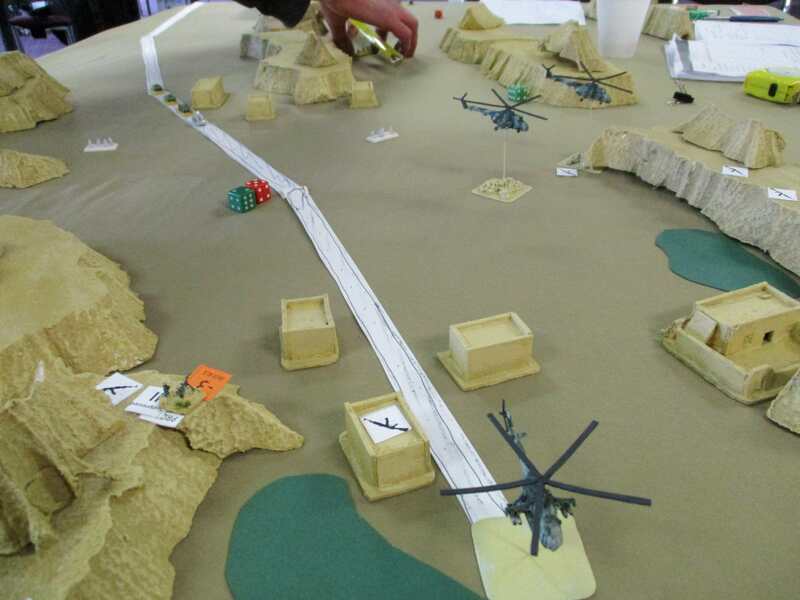 Also as we were playing early war scenarios between DRA units and lee-enfield equipped Mujahideen would account for a lot of the limited damage the units took. Still calling close range “lethal” and not “demoralizing” is confusing when the true game effects. Just my $0.02. Some other thoughts out side of the video. You state the size of infantry squads as between 5 and a dozen fighters. Using your carrying capacities of soviet vehicles Soviet infantry squads are clearly 2 (or at most 3) troopers while teams are single individuals or at most two man weapons crews such as lmg teams. Perhaps more clarity in future releases. The early Hind A only mounts a single 12.7 in the nose. Treat it as a single DShk. The Hind E comes in 2 varieties. 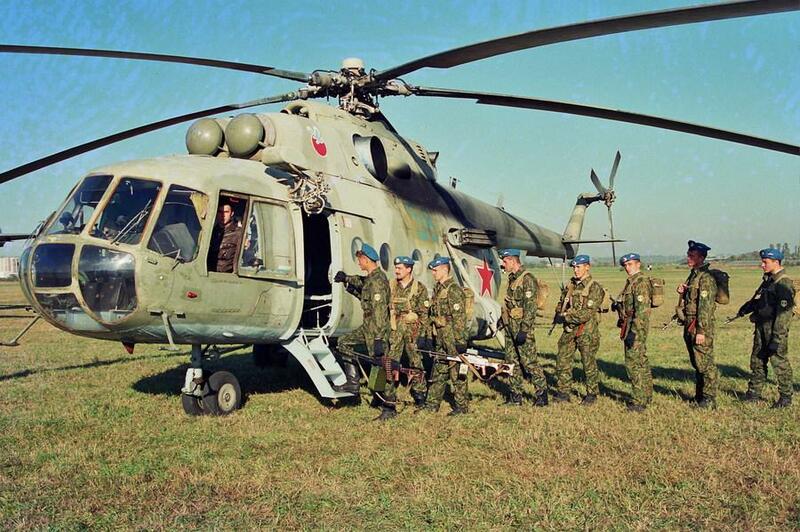 The Mi-24V (the most common of all Hinds) is similar to the D, The Mi-24P mounts a Gsh-30K twin barrel cannon fixed to the side of the nose firing directly forward and does not have the Yak-B, I can find no info on how common (numerous) this version was. The Hind F (Mi-24VP) mounts a GSh-23L twin barrel gun in a redesigned turret in the nose which replaces the Yak-B. Very few were made and soon withdrawn as the system was unreliable. Thank you for the video it showed we were doing most things correctly and how with more capable forces and more time the combat results did build. Please take all the above, like my email questions above, as intended as very interested players looking to help improve the game as well as ensure we were playing it correctly. Thank you. The wording of the Soviet Reactions 4 and 5 should be swapped. Definitely agree with this, I will make Civilians block line of sight exactly like friendly units. Why have different quality levels of spotting teams? This is in case they take fire and need to take morale checks, or if they need to search for nearby hidden units or reveal dispersed markers. There will be the odd time when they need to take a quality check, but calling in support is not one of those times. I could potentially alter the points of the veteran and shaky versions, or make them do a quality check to call in support. I will probably go for the former. I quite like the drawing cards as you know eventually a face card will come up and its a fun dynamic, sometimes its nice to do something that isn’t rolling dice to have a bit of a change. You’re right though: I could probably make this a D6 roll, but I would prefer to keep it as is. 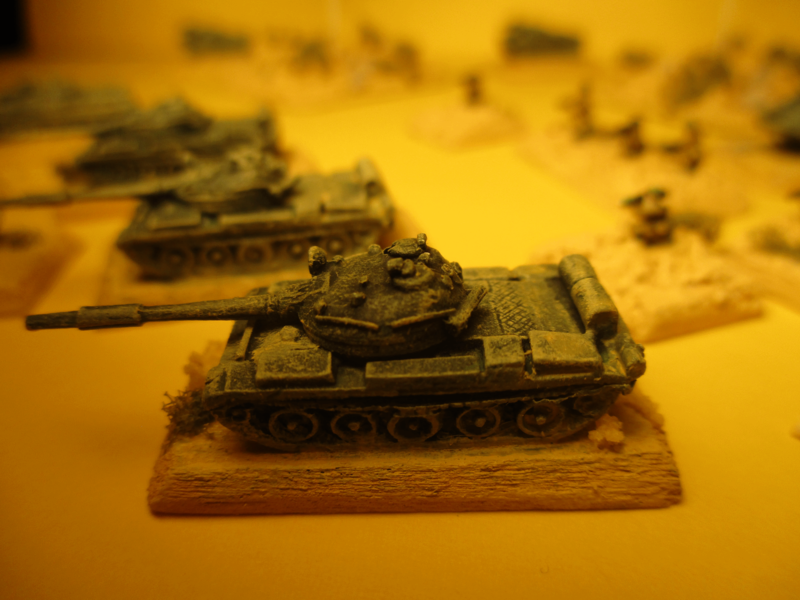 With regards to Soviet transport space: I do make a mention of the smaller size of soviet units and the way their squads were set up, although this is under the “notes from the designer” section rather than in the main rules. I should really mention this under the Vehicle Transport rules. With regards to the Hind: I believe I went with the Hind D, having the Yak-B, rocket pods and what I thought was an exterior gun pod. 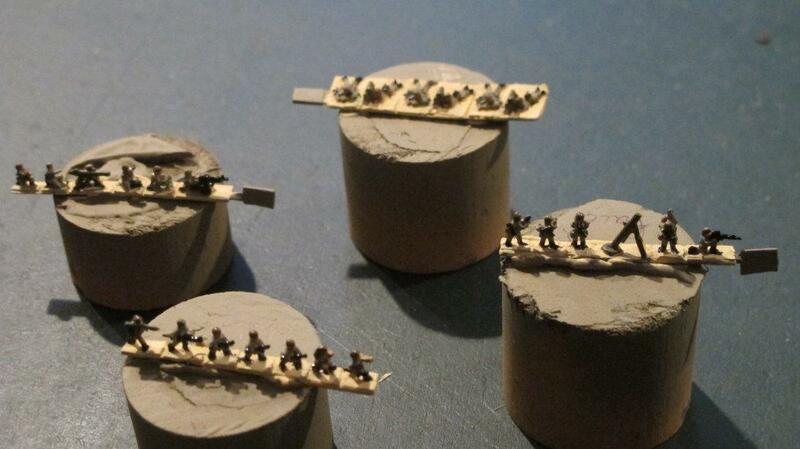 I think the remedy here will be to remove the 23mm Gun pod and just have the Yak-B and the rocket pods. Thanks for the PDF though, I have downloaded it and will have a look. Thanks again for your comments, I will work through these and put together a latest version which I will release through Wargame Vault (and which will be automatically available to everyone who has purchased the rules). Are drawn cards to be discarded or shuffled back into the deck? Based on your above and the fact assets can be played during a game and are held I assume they are discarded. This should be noted in the rules, preferably under things needed with the following issue addressed there as well. I didn’t find it. Also it should be clearly stated Aces and Jokers are treated as face cards. As I am not a card player I didn’t know this. The video is very small and the angle poor for this but where (what company) are you sourcing your Afghan buildings? 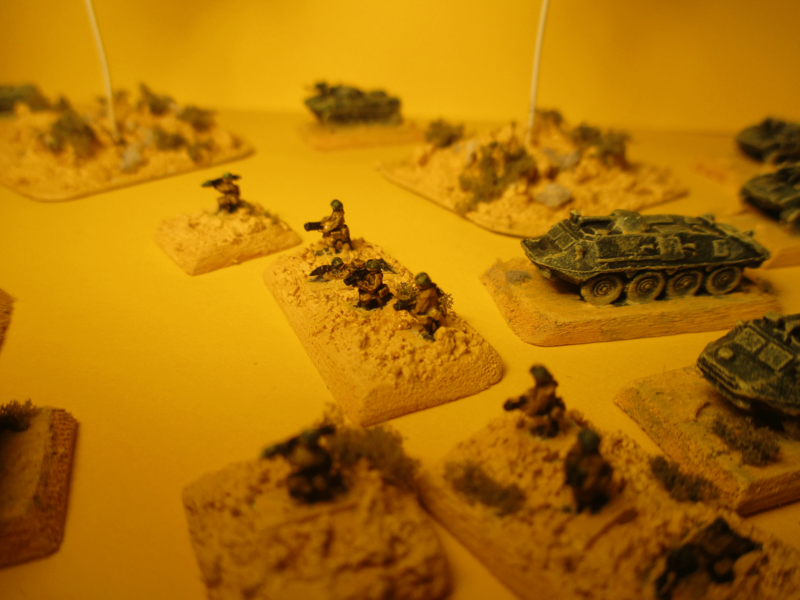 I have been collecting Eastern Front terrain so now I have to spend more! 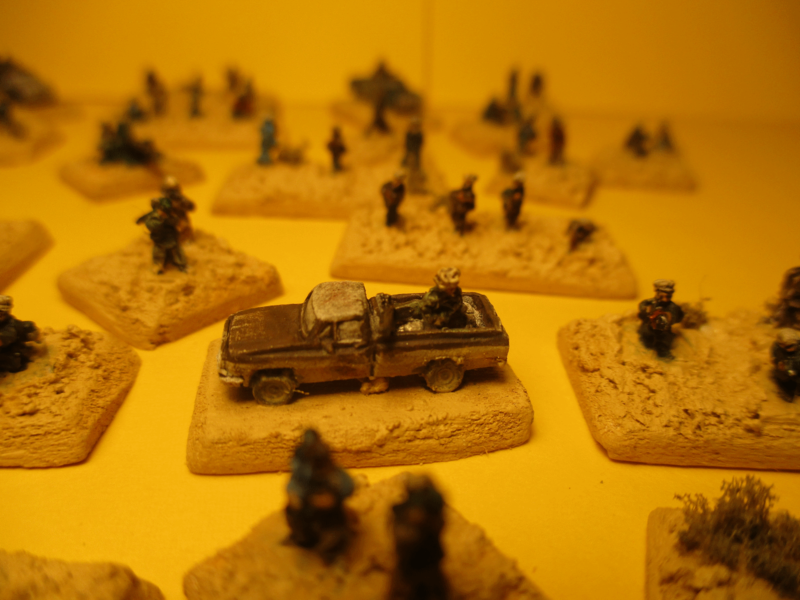 Also which figures are you using for Mujahideen, and can you get any close up shots similar to the above please? This reply was modified 1 year, 4 months ago by Stephen Madjanovich. Hi Stephen, I will specify the playing card details – good point! And yes all cards that are used, from assets to cards drawn from the deck to check for support are discarded. All the figures I use are Heroics and Ros 1/300 scale (6mm). So the Mujahideen figures are the “Taliban” series, from the irregular modern range? Sorry to be pedantic but I am close to ordering and want to make sure the H&R would make a good match. Those look great. 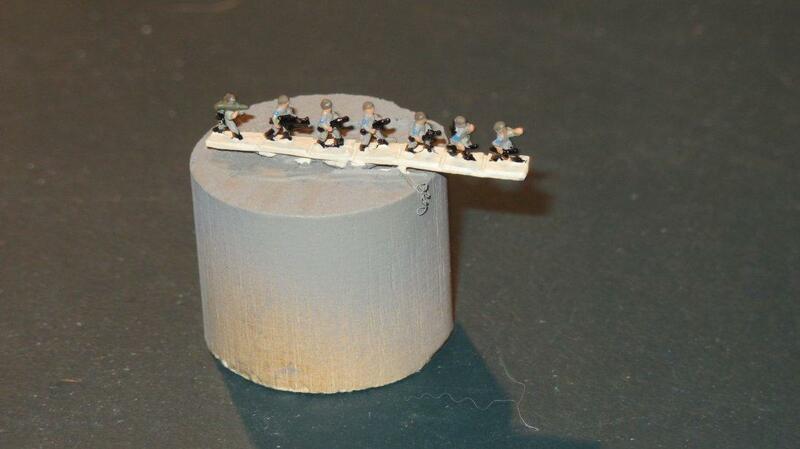 For our games so far I have been using very old (30+ years) H&R WWII Germans painted white for winter! I have some of the M21 rebel forces which look the part for DRA troops as they have BDU style caps. 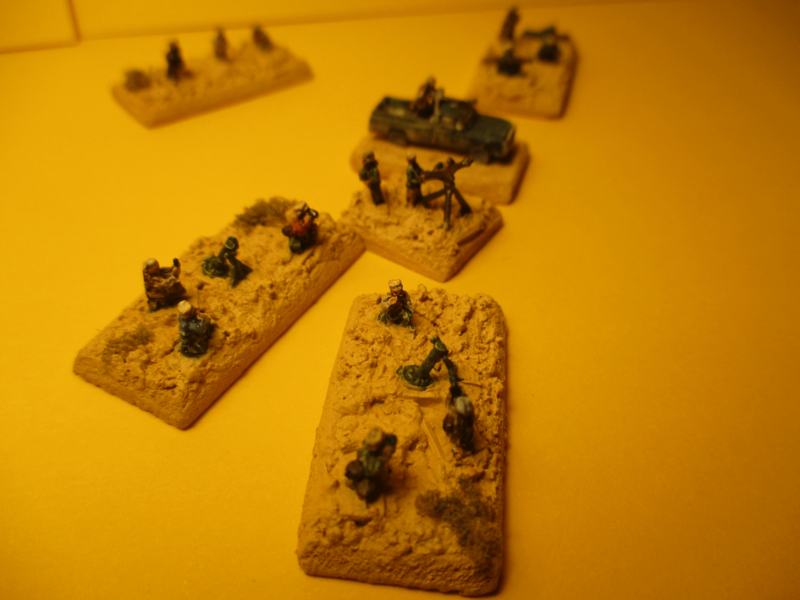 I have just started painting them and the same vintage M7 Soviet airborne troops. The M7’s head covering is indistinct but I have been conversing with the fellow at Tiny Metal Men blog and figure they have the padded jump helmets on. I would like to find figures suitable for the peaked “smokey bear” bush hats. 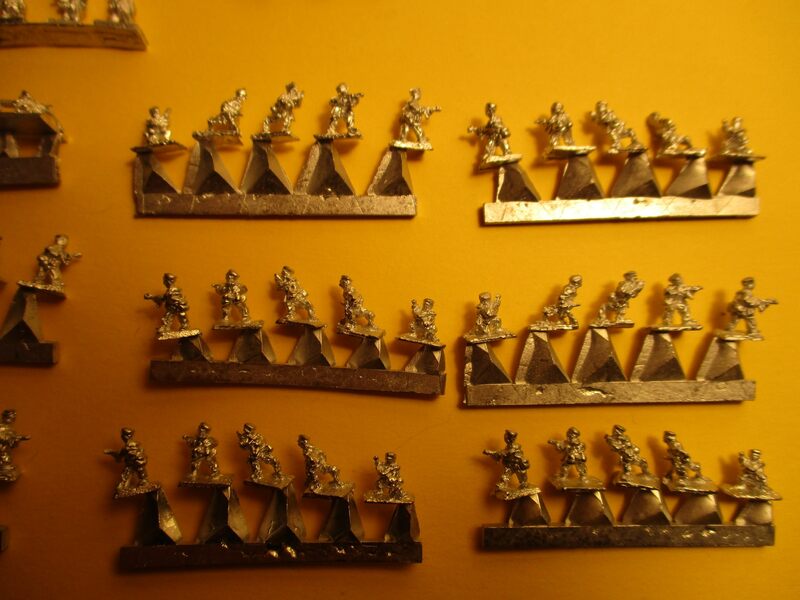 Out of curiosity do you remember which figures you are using for the Soviet Infantry (specific version)? 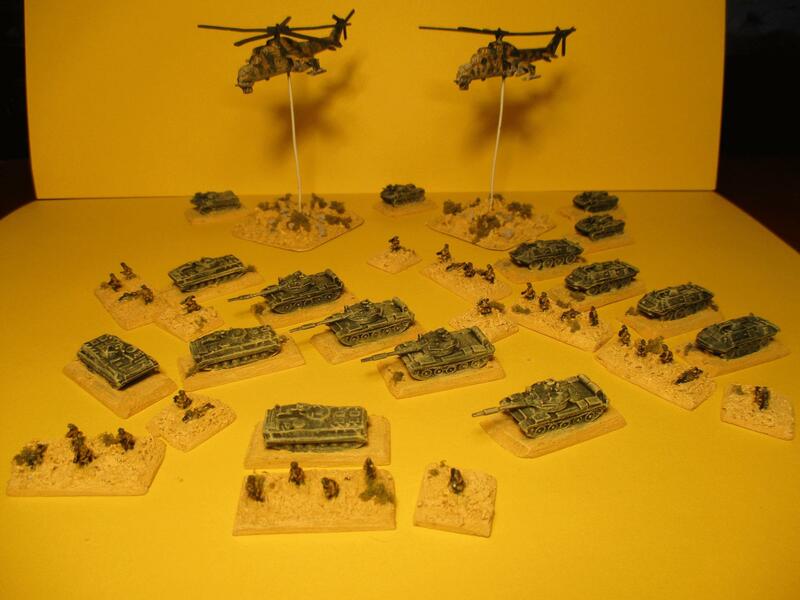 Also if anyone has some of the new Soviet Paratroops (VDV) figures and could post some it would be appreciated. I will post some pics of my figures, in progress paint wise, if people would like. Thank you for your replies. You mentioned buildings: in 6mm, I have used Hovels and Timecast Arab/North African/Libyan buildings, all of which paint up very nicely. 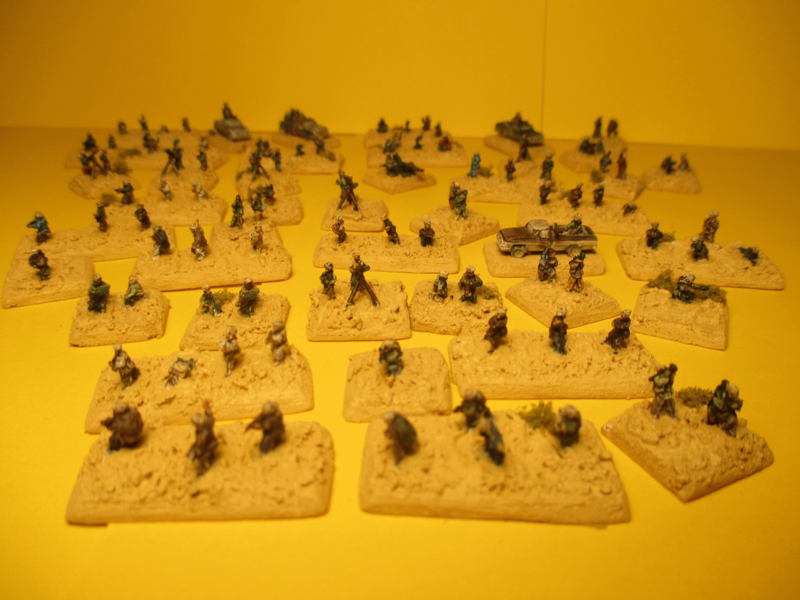 For figures, there are choices from Heroics and Ros, GHQ and Magister Militum. This reply was modified 1 year, 4 months ago by alan. Thank you for the info. I am familiar with H&R and GHQ. Finding pics of H&R figures is hit and miss. 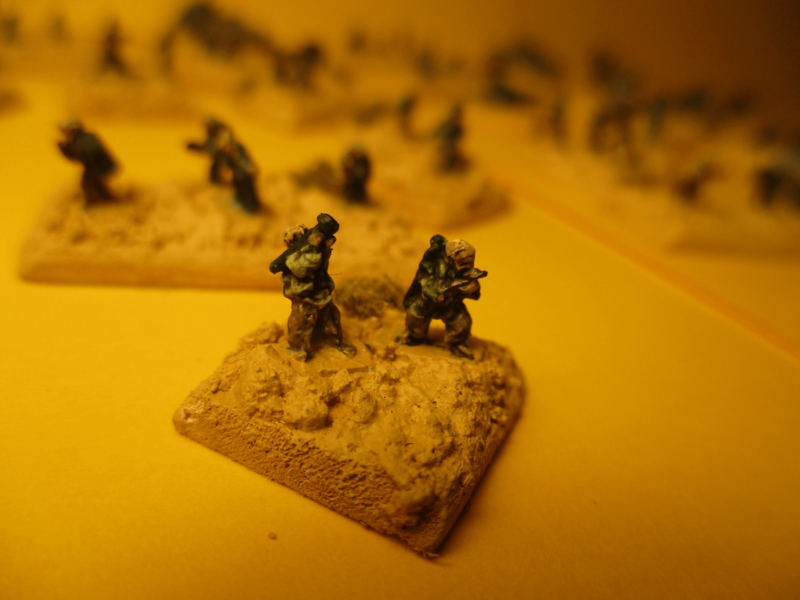 Plus when H&R posts pictures, especially of their figures, they are small and obscured by “terrain”. GHQ presents theirs so much better. As for buildings I think I will go with roll your own. I have tons of balsa and bass (my other hobby is RC planes and my balsa stash is legendary in these parts) so finding suitable pictures and away I should go. Plus based on reading it seems a lot of Afghan built up areas are more a series of homes linked to common walled courtyards. Sounds like they have been dealing with bandit culture for an awfully long time. Yes those Mujahideen are the irregular taliban miniatures. H&R are good price – the detail quality for that specific range is not as high as the GHQ taliban/mujahideen, but for such a small size no one is going to notice unless they look Veeeeery closely. Plus the GHQ miniatures are much more expensive. You can see they have nice berets on which helps them stand out against the regular helmets of the other Soviet troops. The detail level is also very good, these being a newer range. 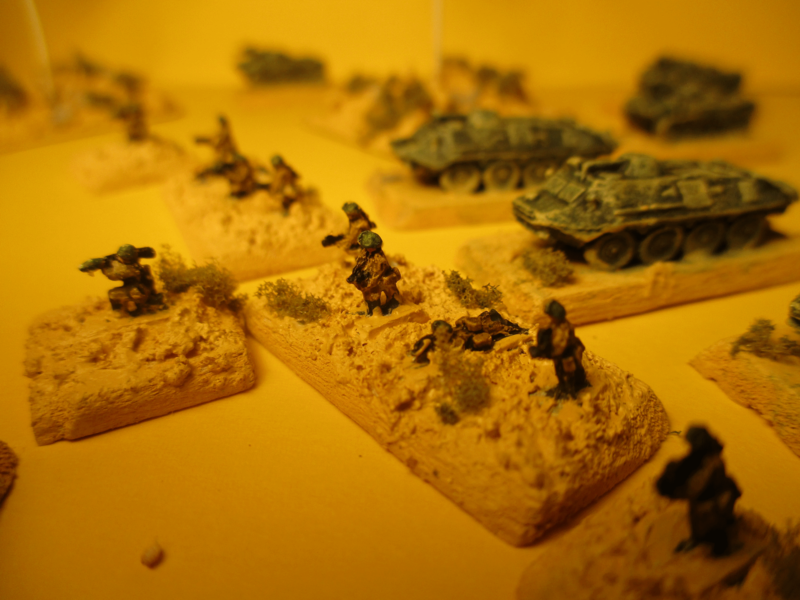 As for my soviets I believe they are mostly the M17 – Soviet infantry in action. I have some close ups of them as well. The detail level is not quite as good as the new VDV, and sometimes its not until you paint them that you can tell what is what. 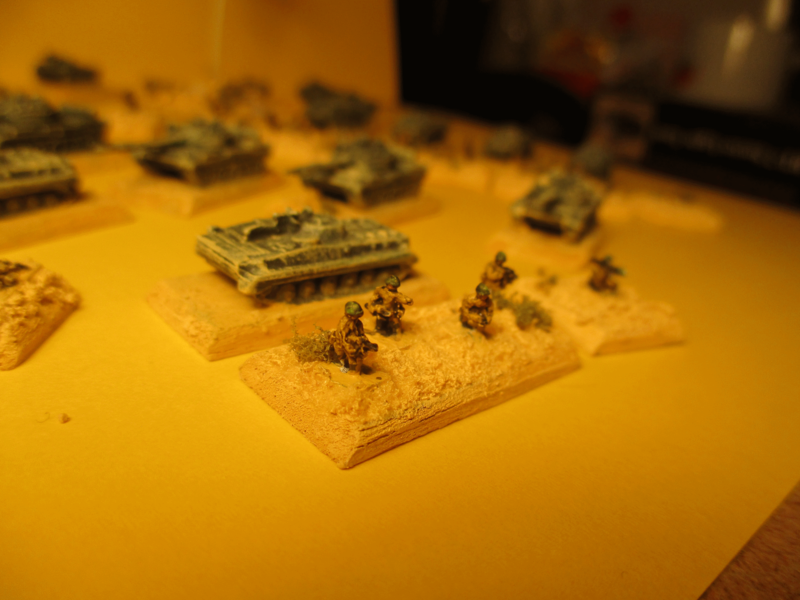 But hey, they’re 6mm scale so everything is tiny and all the photos are VERY close, like 1″ or 2″ from the miniatures. A human eye cannot see this well. Thank you. Now I have to add them to my order. I hope I get some cash for Christmas! The berets are going to be great as now I can paint them blue. I see they have gone from being long strips to individual figures like GHQ. I like the long strips as I hot glue gun them to 1″ dowel stock for handling while painting. My human eye used to work that well. When I was a teen I used dead slot car motors for wire and made up turret baskets. Now days, 40+ years on, out comes a 3x power hood style magnifier for painting. I still prefer 6mm, mostly as I have lots. My weak point is terrain. I say as I look to my left at the stash of 1/2″ styrofoam sheet to be made into hills. The berets are going to be great as now I can paint them blue. Just looking at your paratroops again the tune Raspberry Beret keeps coming into my head. Shades of Bongolesia! I think this was courtesy of The Miniatures Page! My Gulf War jets were painted up back in the day. Used to play lots of competitive level Air Superiority. 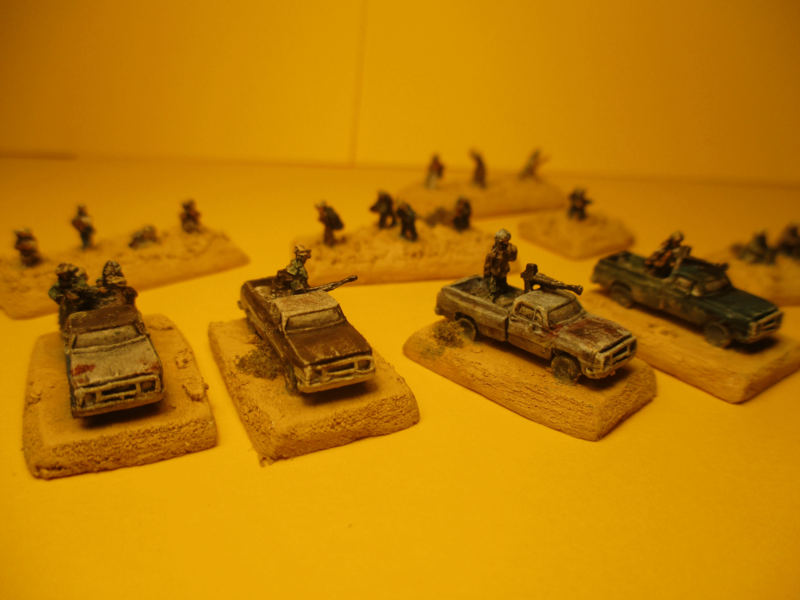 Converted it to miniatures using 1/300, 6mm and 1/285 lead and some 1/350 plastic as well as a mix of unknown scale die casts. Oh nice! 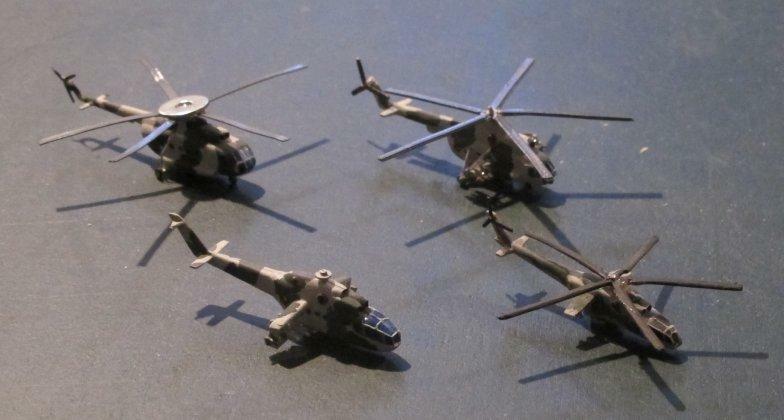 All my aircraft are 1/600 from tumbling dice, from WW1 to modern day. I’ve painted up aircraft from Vietnam, Iran-Iraq and Falklands so far, now on to the Gulf War – mostly NATO I need to do as all the Iraqi aircraft are already done from the Iran-Iraq war. Decals! Wuss. Back in my time we didn’t need no decals. Also walked up hill to and from school through 6 feet of snow all year round! Great website. I also have the “build your own imagination” publication. I don’t know how you feel but a link (page?) giving a little info on yourself and an email or reply for contact info would be nice. If only I could round up some opponents in my area (GTA). Around here the miniatures players hide under rocks and seem to play only one game. I would say 95% play GW or similar stuff only. Us old school and varied interest players are harder to come by. I have found a few and want to get H&S down pat before introducing it (again). I have played it with a couple guys and posted the issues and concerns above. I really hope to give it more tries and see how it goes. Good luck with your games Stephen, I will try to get the updates done over the next week. I would also like to send you a printed version if you don’t already have one. Email me with your address if you’re interested -although It will take a few weeks for the new printed version to be ready. If anyone is interested in my aircraft flight stands here is a link. Mine are the the second last post, my user name (and AS handle) is Madman. 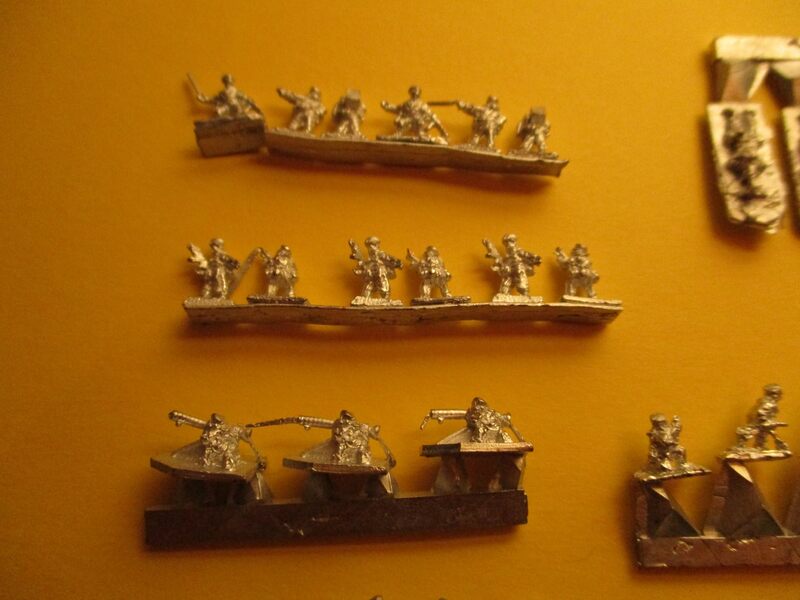 Here is a link to the page on Tiny Metal Men with pics of M07 Soviet Airborne troops. A few sites of interest. 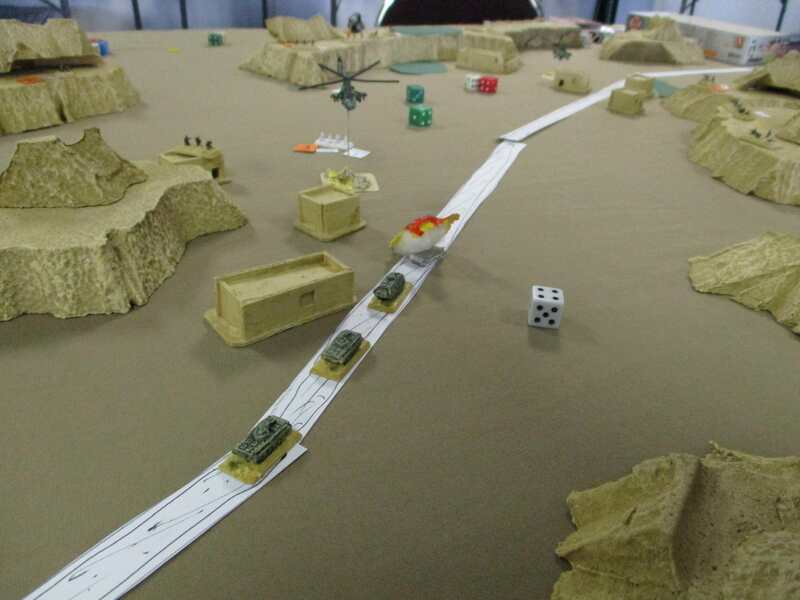 Large terrain boards if you like fixed terrain. It took me a while searching around to find part one. There are three parts in total. OK what are the limits on pictures downloaded here? I am trying to down load pics smaller both in dimension and total file size than above and being bounced with no explanation, like other sites, as to what the limits are. No where can I find anything about image limits. You can not upload images greater than 2mb. You can download any size of image. Or you can link to images on other sites of any size. It has been too quiet on this topic so here is what I have been beavering away at over the holidays so far. 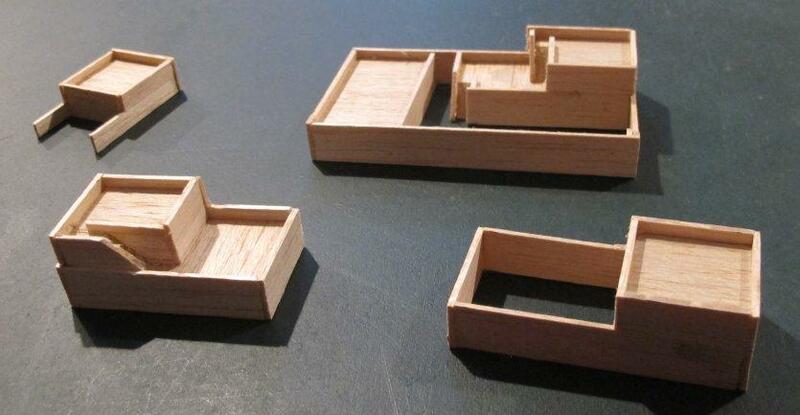 In the spirit of Ben’s Soldiers site I have been making balsa buildings for Afghanistan. The thicker wood making the bulk of the buildings is 3/8″ which works out to about 10 feet. The thinner material is about 1 mm and smooths out the surfaces of the end cuts and provides material for the compound and roof top walls. I plan on coating the wood with straight or slightly thinned carpenter’s glue to provide a surface suitable for taking paint. I hope to find a light sand spray can. The first picture is basic building blocks to be assembled into various Afghan compounds. Here are some complete compounds based on GC minis designs. 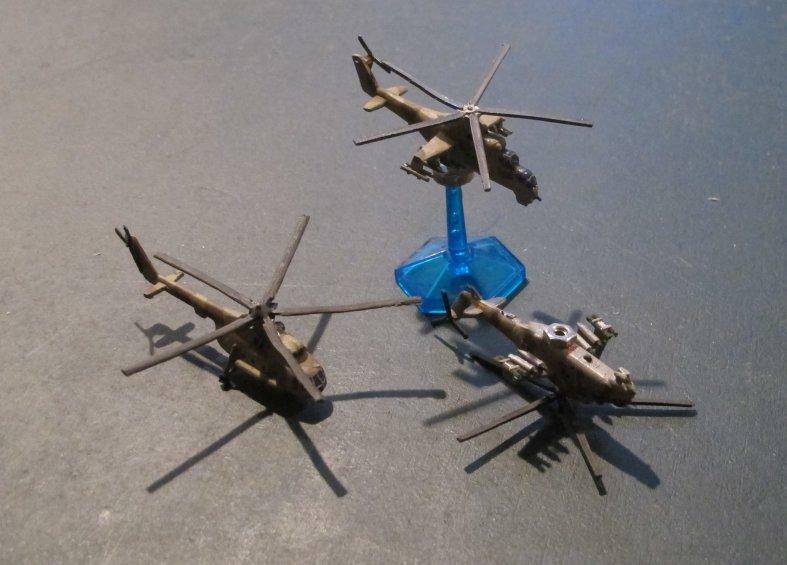 Here are some 30 year old helis. 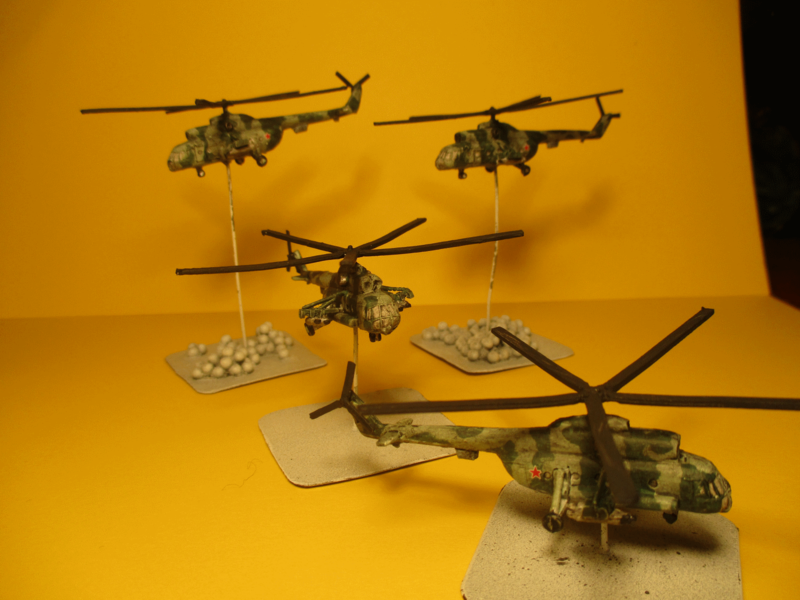 The Mi-8 with the washer glued to the blades for strength (yet to be painted) is by C in C. The other Hip is Heroics and Ros. The two Hind As are GHQ (no rotors) and H&R. These are all H&R. The right side up Hind is on some plastic stand which I have glued a super magnet to to represent low level flight. The inverted Hind shows how I have glued a nut to the bottoms of the helis. They also hold the Hinds level while “landed” as well as work with the stands. 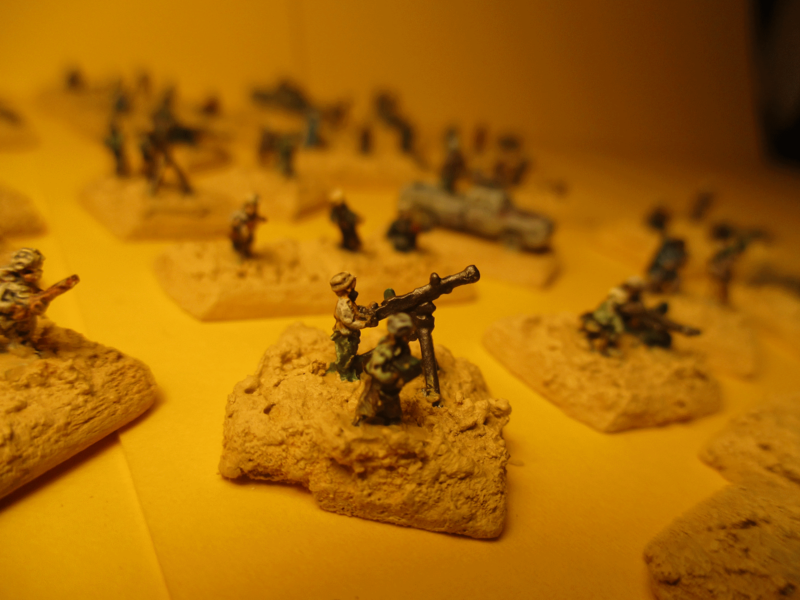 Finally some Soviet Airborne troops I have gotten around to painting. 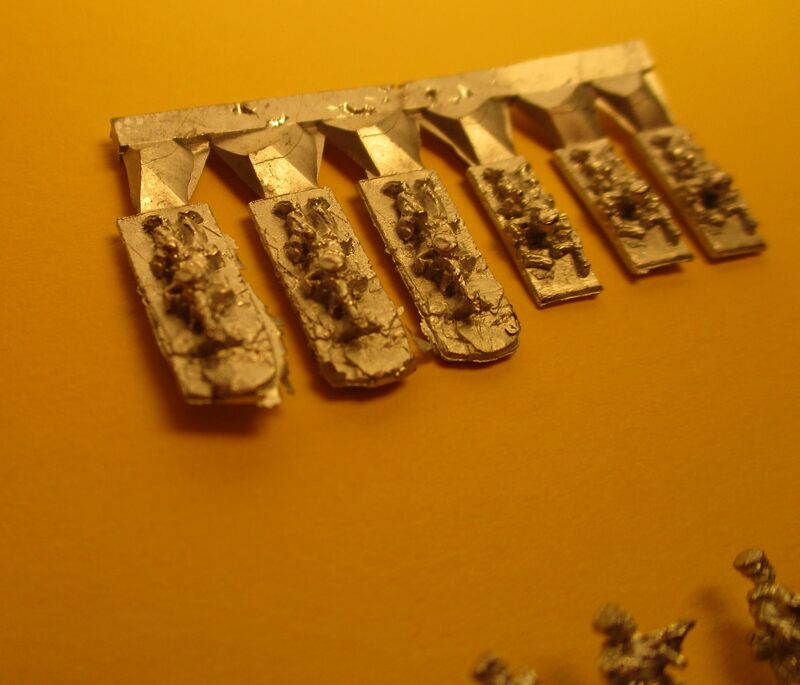 They are set M7 and include three or four strips of basic troops and two strips of each heavy weapons sets. Here is a close up of the troopers. Just as a comparison here are some eastern front buildings made from materials acquired decades ago. The unpainted one shows the construction, two lengths of 3/8″ square acrylic capped by a 3/4″ triangle stock. The ends are capped with thin, in this case clear, styrene. The rods are sold in lengths. I do not remember if they were 3, 4, 6 or 8 foot long. I still have a bag of cut lengths and about a dozen and a half made up buildings of various lengths and heights. Looking great Stephen! those Afghan buildings came up a treat! just need some textured paint on there and you’re good to go. For my buildings I mixed some sand-colored paint with a bit of baking soda for texture, then after that was dry, did a drybrush of a lighter sand color (Without any baking soda). I’ll try dusting with baking soda after sealing the wood with glue and see how that looks (wet glue). From the pictures I have found (Google) the buildings look pretty smooth, especially at our scale. Tom. From your post earlier up this page. How did you make the hills? This is still my very weak point. I have some thin insulation foam, now to get to it. I am updating my print copy of the rules with the errata and suggested errata. From what I can see, the amendments are on pages 1, 2, 29 and 47: are there any others? The only other change is the clarification that drawn cards are discarded: do you want to suggest “official” wording in some particular place? Hi Alan, the PDF version is updated, so you can download the latest through Wargame Vault. If that doesn’t work just drop me an email and I can send you the latest. i do indeed have the updated pdf from Wargames Vault. I have played about a half dozen games now with different opponents or as an umpire and have some feedback and thoughts on where to take this. I am looking for like minded gamers willing to tweak a system to make it what we would like to play. Thank you in advance.